Healthy feet are the portals for a healthy heart and blood circulation. We rely on our feet so much and yet forget to take care of them. A large number of nerve endings are concentrated in the foot. This is what makes them sensitive and prone to damage by physical stress. We all know how relaxing and rejuvenating a single massage session can be. Because of our busy schedules and hectic lifestyles, we can’t take the time out for a spa session. So why not bring the spa at home with our compact and portable Shiatsu massager? Why choose Indian lily’s foot massagers? At Indianlily, we strive towards making our customers healthier and happier. A product of ancient oriental wisdom combined with the latest technology, the Shiatsu foot massager is effective, lightweight and durable. Indian lily’s products are inexpensive as compared to other products that offer similar functions. The Shiatsu massager comes with five settings of kneading, rolling, scraping, air-pressing and heating. The unique design makes sure that acupuncture points get stimulated for maximum benefits, just like a professional massage. The LCD Screen displays the modes and lest you select your preferred strength. 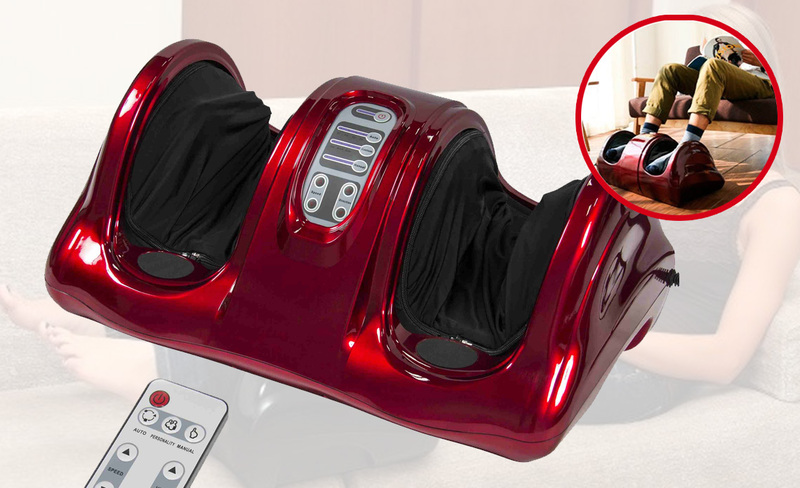 By choosing the heating therapy in this massager, you can improve your blood circulation significantly. People who have tried Indian lily’s Shiatsu leg massager have recommended it to others as we all know the word of mouth counts. This massager covers the foot arch and heel area from all angles. Priced reasonably at 3250 rupees, we assure you that this massager will exceed your expectations. If you want to buy a leg massager which can relieve muscle pain, stress and sprains, this is the perfect massager for you. Apart from this, we also offer neck, shoulder, back pain massagers. So order online today and get instant relief from muscle stress and strain! Treat your body like the temple it is.